Lloyd Cole is the true definition of an adult rock cult artist. In the mid-80's, Lloyd Cole and the Commotions had a good success ride overseas with their folk/rock blend of Dylan and the Talking Heads. Cole stuffed a lot of words into stream of consciousness songs like "Perfect Skin" at almost early Springsteen-like levels. In States, the band was strictly under the radar. 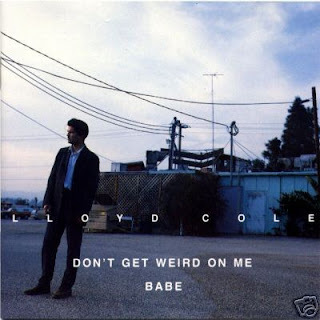 By the time he ditched the Commotions and released his second solo album, Don't Get Weird On Me Babe, Cole had moved to the United States and recruited some of the same brilliant musicians who played on Matthew Sweet's classic power pop album, Girlfriend, like Fred Maher and Robert Quine. It may not have been a coincidence, since he was definitely aiming for some kind of crossover success, betting on intelligent guitar-driven power pop and ballads, so why not employ a similar cast? His real gambit was the single "She's A Girl and I'm A Man," a clever tale of turning the tables sexism that probably went over the heads of many listeners not hip to the lyric's irony. Thankfully, alternative radio and college programmers got the message and dug the big echoey guitar riffs, mammoth melody and four on the floor drums. When you first listen, you think some of the words are a bit harsh, but then you realize there's a lot more going on. The song pries into the male psyche of putting women down, getting hitched, only to find out that his wife is sharper than him: "You're not cool, you're just like me, you're a stupid man...." With lyrics this subtle, you had to listen to it a couple of times to appreciate Cole's ambitious songwriting craft. She said she didn't understand him so she guessed he was deep. He swore he'd never been to college and was too tall to be. So as she led him to the slaughter thinking she'd be laughing last. Now the lady in the question is his better half. She's got to be the stupidest girl I've ever seen. She don't care who, why, or where I've been. She's got a right to be, with all that's wrong with me. But she doesn't want to understand . That she's a girl and I'm a man. He thought that women and drink would make a man out of him. But the extent of his studies left a jaded man. So as she led him to the altar he was easily led. And when they asked him if he did, well then, this is what he said. If you're morose over the deteriorating state of adult rock music, then do yourself a favor and have your faith restored by buying a used copy of Don't Get Weird On Me Babe. Enjoy the video here on You Tube (there's no embed code, unfortunately) and the beautiful gold hollow body guitar Cole plays in it.